When it comes to potting up plant materials for the home and garden containers you wish to display around your house, you have so many choices. Many homeowners want color so they go with flowers and bulbs. But, another wonderful option is shrubs and if you want color flowering shrubs. They are long lasting, durable and beautiful. Below are a few choices of shrubs that work wonderful in garden containers & all kinds of planters. 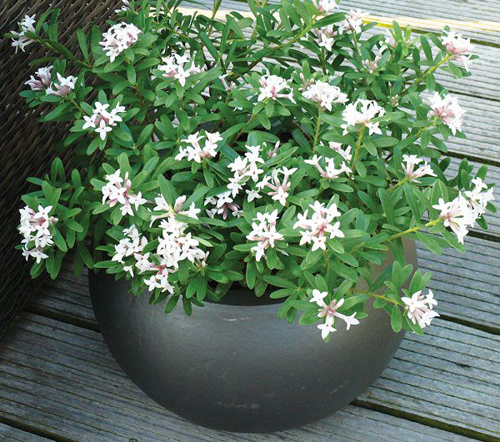 Andromeda - This shrub grows in containers similar to an azalea pot. This means acidic soil and subtropical climate. It take's a bit of care but can be a beautiful potted addition to any patio or porch. Aster - When potted the aster shrub is great for cool temperature zones and mild summers. Because of the variety of colored bloom's it produces, it's very popular. Easy to grow in both summer and fall. Bougainvillea - While you mostly see these planted in the grown and growing up the side of homes or commercial building, they were wonderfully in a potted plant. Their bright hot pink blooms make them popular for containers around the house. They require very little care which makes them popular. Full sun, dry soil and good to go! Boxwood - What we really love is their evergreen look. Perfect for topiary bushes & trees these wonderful shrubs can be cut into many shapes and look awesome. 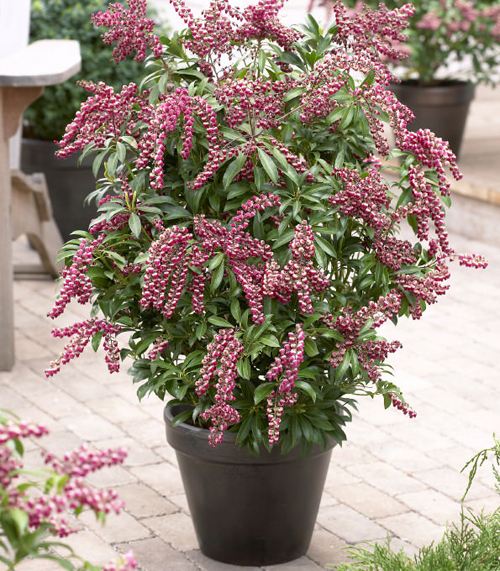 It grows everywhere and is a landscaper's dream for potted shrubs. Camellia - Mild summers lend themselves to productive camellia growth. Bright blooms and dark green leaves make a wonderful potted display. Requires rich acidic soil and regular maintenance so make sure you can make the commitment. Daphne - When you want a shrub that smells heavenly, then plant some Daphne. Areas with extreme winters and cool summers are most suitable. Keep the pot in the shade and water it well in the summer. It like moist soil.